Chelsea's title hopes suffered a major blow after they were held to a 2-2 draw by Bolton at Stamford Bridge. The result, and Manchester United's comeback win at Everton, means Chelsea sit five points behind the Old Trafford club with just three games remaining. Chelsea threw everything into attack in the closing minutes but they could not find a way past a stubborn Bolton rearguard. Despite widespread changes to their side, Chelsea started on the front foot and Kalou wasted a good opening on seven minutes when he got in down the left, but could not pick a team-mate out as his cross ran right across the face of goal. Bolton showed they were not in West London to make up the numbers and went close to scoring on 14 minutes when the ball broke in the box to Nicolas Anelka who curled his shot over the crossbar. The visitors then stunned the home side on 19 minutes when they took a shock lead through Michalik. Chelsea failed to clear Andranik Teymourian's free-kick properly with Kalou's clearance falling to the feet of Michalik who fired his shot past Petr Cech to net his first goal for Bolton. 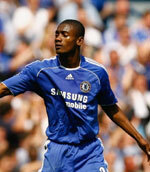 The goal stung Chelsea into action and they drew level just three minutes with Kalou netting a superb goal. Wayne Bridge flighted over an inviting cross from the left and Kalou cleverly glanced his header into the net to bring the crowd to its feet. Chelsea were almost gifted the lead on 25 minutes when Ricardo Gardner deflected Shaun Wright-Phillips' shot towards his own goal, but Jaaskelainen reacted quickly to turn the ball round the post. The home side continued to lay siege to the Bolton goal and Andrei Shevchenko went close to scoring on 27 minutes when he turned on the edge of the box and drove a left-footed shot just wide of the target. Chelsea suffered a blow when Ricardo Carvalho was forced off with a knee injury giving Jose Mourinho a scare ahead of next week's Champions League clash with Liverpool. Frank Lampard replaced Carvalho meaning Michael Essien was drafted back into defence alongside John Terry. Chelsea were unlucky not to hit the front just past the half hour mark when Shevchenko saw his brilliant volley from Bridge's cross acrobatically tipped over the crossbar by Jaaskelainen. From the resulting corner Essien wasted a great chance to score when Jaaskelainen came out and missed Lampard's delivery allowing the ball to drop to Essien who, with all the goal to aim at, dragged his shot wide. Chelsea grabbed their second goal on 34 minutes when Kalou rose highest to meet Lampard's corner and, in trying to clear the danger, Idan Tal headed the ball off the crossbar before it came off the unlucky Jaaskelainen and into the net. Bolton came out for the second half in determined fashion and drew level on 54 minutes through Davies. Gary Speed flighted over a free-kick and Davies lost his marker to head home from close-range. Michalik had a lucky escape on 57 minutes when he tugged back Chelsea substitute Didier Drogba as he tried to race clear on goal and the big defender was booked by referee Rob Styles. From the resulting free-kick Drogba curled his effort over the wall and onto the top of the net. Mourinho introduced Joe Cole on the hour mark as his side went in search of a crucial third goal. Lampard had a sight of goal on 66 minutes when he found space on the edge of the box only to drive his shot wide of the target. The impressive Kalou worked an opening for himself 16 minutes from time when he beat two defenders out on the left and cut in only to drive his shot wildly over the crossbar. Chelsea were left fuming on 75 minutes when Abdoulaye Meite handled the ball on the edge of the box in preventing Drogba getting round him, but much to the annoyance of Mourinho their appeals for a free-kick were waved away. News of Manchester United's comeback and Bolton stubborn's resistance appeared to knock the stuffing out of Chelsea as the home fans went silent inside Stamford Bridge. Chelsea threw everything into attack in the closing minutes but they could not find a way past a stubborn Bolton rearguard as they dropped points for a second successive week to leave their grip on the title hanging by a thread.